Smartphones and tablets are wonderful inventions which can bring us a huge amount of enjoyment to our lives now. However, it is also worth bearing in mind that they can be used to help us get our financial life into shape. If you would like to use modern technology to sort out your finances then here are a few apps to get you started. One of the most useful apps around right now is the Meter Readings one. This should cost you about a pound and it could end up saving you a decent amount of money. Quite simply, it allows you to track the amount of energy and water you use at home. It is reasonably difficult to set up but once it is up and running you can very easily check what you are currently spending and whether an alternative supplier could give you their services for less. If you already use PayPal then you will definitely want to get this free app on your mobile device. If you haven’t yet started using it to send or receive money online then now might be a good time to start doing so. The password you use on here will be the same use you use on your PC and it is really simple to use once you get going. This is a good all round finance app which lets you keep track of your outgoings. It costs a few pounds but if it helps save you money on an ongoing basis in the future then it would be well worth the cost. One of the stand out features of PocketMoney is the panel known as the budget bar. On here you can choose how your broken down outgoings are represented so that they make most sense to you. 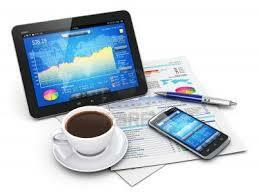 This is another free app which could make your finances that little bit easier to track. With Expensify* you can track all of your business expenses in one place instead of having to root about in your pockets at the end of the month to find bits of paper. You can use it to link to your credit cards and ban account, as well as to take pictures of smaller receipts for cash purchases. Any smartphone user who likes to get involved in the stock market would be well advised to download the Bloomberg app for free. This is widely recognised as the best app for tracking prices and news in the market for both newcomers and for experienced traders. When you first look at it you might find the amount of information on display almost overwhelming but you will soon get used to it. This is another app designed to help you keep a better track of your incoming money and your expenses as well. The big advantage to this one is that it is incredibly easy to use, while the graphical representations help make even complex information easy to understand. It costs a few pounds but could do a good job for you in helping you to understand where your money goes every month and whether you could improve the way you handle your cash. This is free app which is said to make your financial life a lot less complicated. It is certainly pretty comprehensive, letting you link your credit cards and bank statements as well as giving you reminders when bills are due and letting you print out any of your financial documents. Well worth a try if you don’t have enough time to sort through all of your paper bills every months. Wow, great collection of finance apps. I’ve never actually heard of PocketMoney and seems like its something I should try since I have a really hard time tracking my expenses the little expenses not charged to the credit card. Cheers Simon! Yep, PocketMoney is definitely worth a try. I use PayPal all the time! One of my absolute favorite apps for sure. I will have to try out some of the other apps you mentioned as well. Thanks Rita, let us know how you get on with them! Thank you for a good list. I also would add Money Lover app (like the name lol). It’s quite convenient to use and highly rate amongst users =) But from your list I enjoy using PayPal, haven’t tried the other though. These are great, and there are definitely a few that I don’t have should definitely download. I still have the generic “stocks” app on my iPhone and it’s just so terrible. Definitely will get the Bloomberg one for sure.